On Oolong Island, the dead of Bialya have come to lay siege to the compound housing the scientists trying to send the Four Horsemen back to their home dimension. 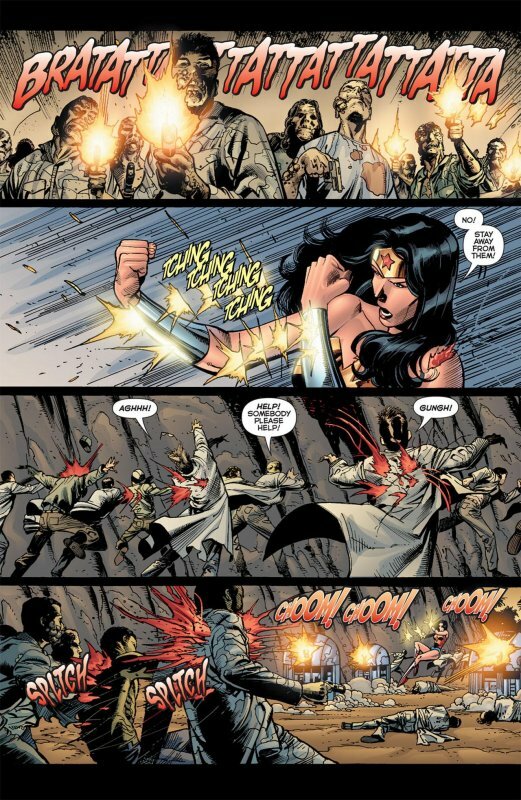 Wonder Woman tries to provide cover for the people on the beach, but the dead are armed and are taking no prisoners. 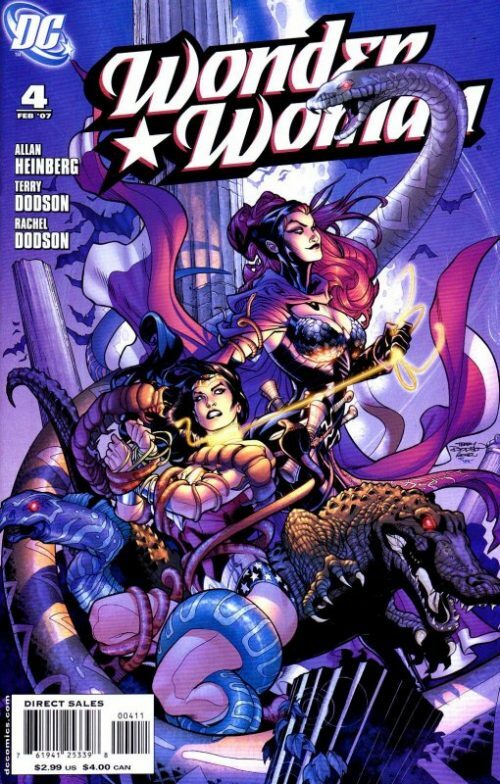 Just when Wonder Woman believes all is lost, Elasti-Girl, Negative Man, and Robot Man of the Doom Patrol charge out of the compound to provide assistance. Robot Man directs the “normals” into the compound, Negative Man’s “Negative” flies through the corpses, Elasti-Girl swats them aside, and Wonder Woman tears through them at superspeed. 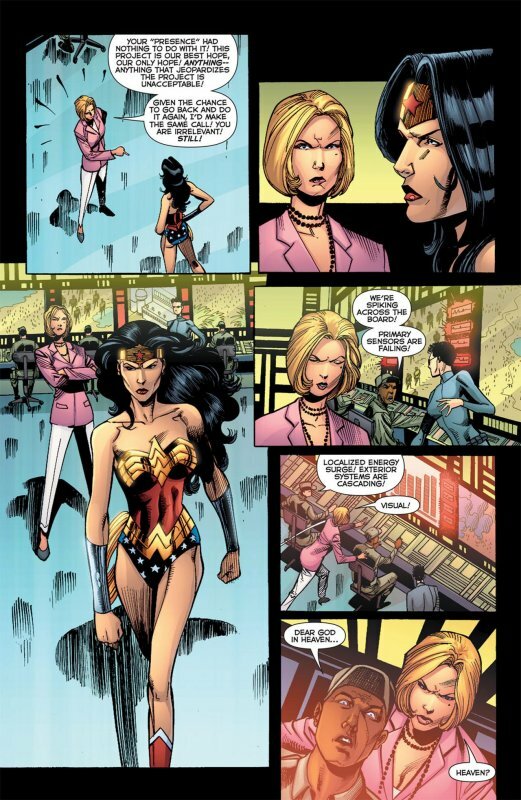 Once all the people are in the compound, Wonder Woman and the Doom Patrol retreat, only to see the recently killed rise up as well. Inside the compound, Veronica Cale is given a situation report: they’ve lost the entire island outside of the compound, but the force field is up at random energy patterns, which will buy them time to finish the portal. Cale chastises Dr. Niles “the Chief” Caulder for the Doom Patrol’s reckless actions, but Caulder says that they bought enough time to finish the project. Caulder further chastises Cale for not revealing the existence of the firepit detonators that Bruno Mannheim and Egg Fu had the Science Squad build on Oolong Island, which had been hidden in Bialya as part of Mannheim’s plan to turn Earth into another Apokolips. Cale says that the detonators used in Gotham City needed time to form a firepit, which is why the city wasn’t incinerated immediately. Caulder further explains that the neural and conductive components in the corpses were used to accelerate the firepit’s ignition. As he rolls off, Cale’s aid reminds her that accidents can be arrainged, which Cale decides to ignore for the moment. In Bialay, Superman is able to overcome the pain of his infection and blast Yurrd and Zorrm with heat vision, then flies Batman and Snapper out of the city to Harjavta, hoping to lead the two away from his friends. 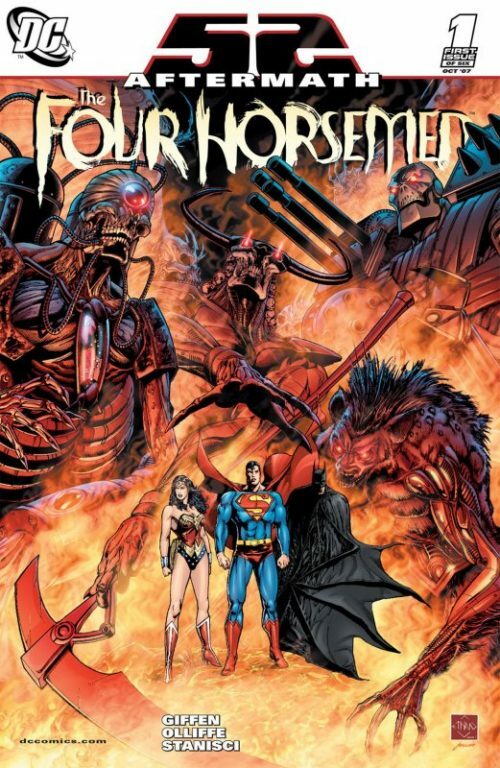 Superman has realised that his infection will allow Zorrm to locate him, and leads the two horsemen out to the middle of the desert. 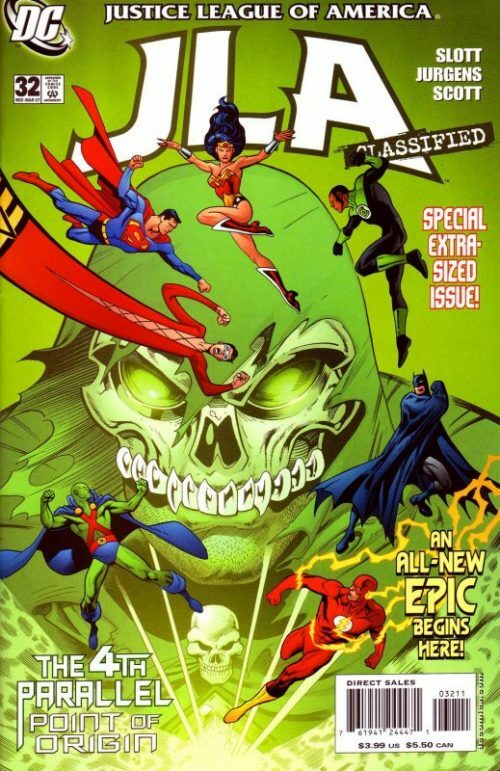 Zorrm quickly grows bored with Yurrd’s attempts to devour Superman, but is suddenly teleported off of Earth by the JLA transporters at Batman’s orders. 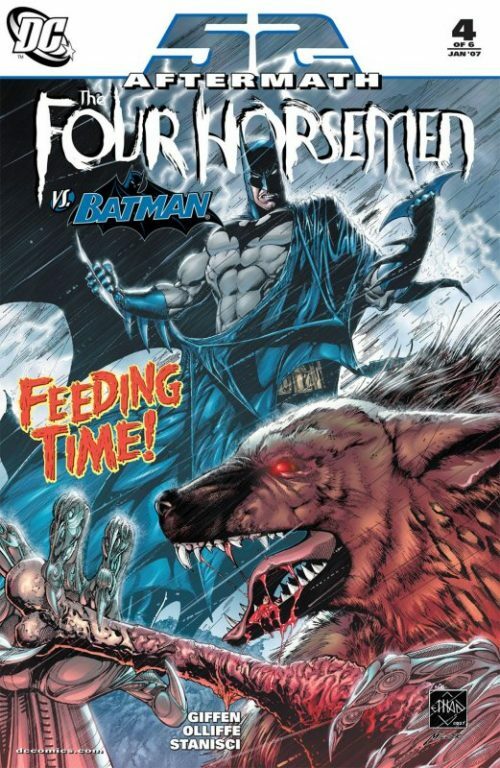 However, Batman deliberately did this to draw Zorrm to him. The Dark Knight is able to throw a gas grenade at Zorrm, which burns the Horseman. Batman and Snapper are able to hide in a medical supply building, where Batman explains that his actions were designed to provoke Zorrm into making it personal. He also tells Snapper to find cover as he works on a plan. In the desert, Superman is winning his battle against Yurrd, at one point even managing to break his nose. Suddenly, Azraeuz appears and strikes Superman from behind with his scythe, having been observing the battle for some time, and disgusted by Yurrd’s inability to kill the weakened Superman. Yurrd is angered that he was denied the kill, but Azraeuz says that Superman is alive, and leaves him for Yurrd to devour at his pleasure. At Oolong Island, most of the dead are outside the force field surrounding the main compound, but a few are inside. Cale is chastising the techs for not deploying the shield when she gave the order to seal the compound. Wonder Woman is disgusted by her willingness to sacrifice her people, but Cale says that the project’s survival is too important, and that anything which threatens the project is unacceptable. Suddenly, the sensors begin going haywire as they detect a surge in energy. Looking on the monitors, Cale soon understands why: the general of the dead army has come, and it is Rogga. At the firepit in Bialya, Azraeuz privately muses on how eager Earth is to welcome them: like Apokolips before it, it is plagued by famine, pestilence, and war. But unlike Apokolips, Earth still knows hope, in the form of the JLA and Oolong Island. Azraeuz vows that when these two bastions of hope are destroyed, the Four Horsemen will rule the Earth.